Lara Croft's father has disappeared from a mysterious island 7 years ago. Now Lara is finally determined to find out what happened. Tomb Raider is directed by Roar Uthaug and was released on Mar 16th, 2018. 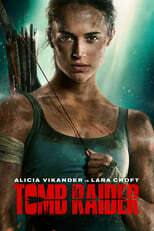 Director Roar Uthaug's Action & Adventure movie Tomb Raider is produced by Square Enix & GK Films & was released 2018-03-05.